The continuing focus of the nine Roundtables held since 2008 has been on the ongoing challenge to organizations to respond to the changes of the 21st century economic landscape. While a number of relatively new companies have emerged as “exponential organizations” capable of growing and changing at a rapid pace, many older companies have struggled to adapt to the new environment. On a fundamental level, the challenge is not simply for organizations to figure out how they can “make use” of new tools and new capabilities, but how they can transform themselves to operate successfully in a “whitewater world.” The good news is that a growing number of organizations have recognized the need to change, and that the tools for facilitating transformative change are becoming available. There are also examples, such as the transformation, under fire, of JSOC, that can serve as inspirational models. But the not-so-good news is that many large, well-established organizations—in both the public and private sectors—have just started on the journey toward a new, more agile model of operating that is based not on scaling efficiency but on scaling continuous learning that is necessary for survival. In the end, making this “big shift” will require strong leadership. It remains an open question as to whether the current generation of leaders can bring their organizations into a new golden age. 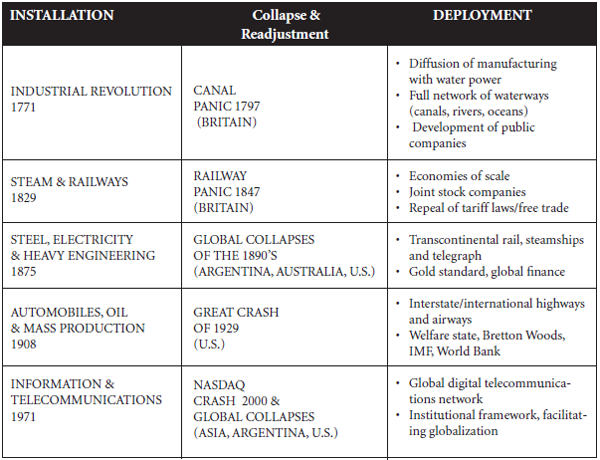 1 Carlotta Perez, Technological Revolutions and Financial Capital: The Dynamics of Bubbles and Golden Ages (Edward Elgar, 2002).